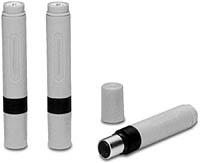 The Ideal 170R Round Self Inking Stamps are perfect for Inspection Stamps and any other small circular designs. Ideal 5700 Square Series Self Inking Stamps are perfect for Inspection Stamps and other stamping needs that require a square shape. 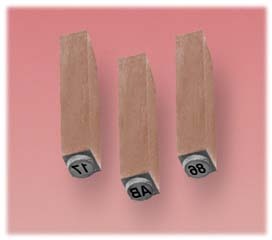 Used in Factories and Offices for Paper Stamping. Recommended for Quality Control Inspection, Computer Paper Control, or for any use. Pre-inked in 5 standard colors - Black, Red, Blue, Violet, Green. with the use of a stamp pad with special marking inks and can also be used to stamp on paper. 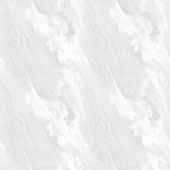 Marks any surface such as Metals, Plastics, Glass, Cellophane, Paper using the proper ink. Manufactured with best quality Neoprene Material, Stamp and Plug are molded into One Piece - Cannot come apart. 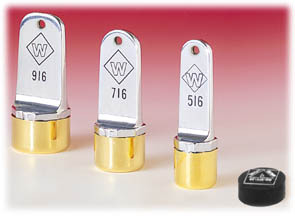 Non-Porous "W" Super Stamps are used for marking Metals, Plastics, Glass, Cellophane, Circuit Boards or any Dry, Clean and Non-Oily Surface. The "W" Super Stamp works without the use of a stamp pad. 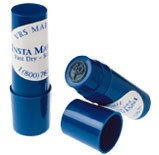 The Insta Mark is excellent for all inspection marking on non-porous surfaces. You may choose from the standard symbols or you may customize any configuration you need. IM146 - 1/2" X 1 1/2"